SPEAKING AS A BUSINESS STRATEGIST, civic leader, and philanthropist, Robert Woodruff always said that it’s easy to see down into the valley and up the next slope but tough to see over the next hill. No one knew better than he the value of clarifying where you’re headed and why you intend to go. 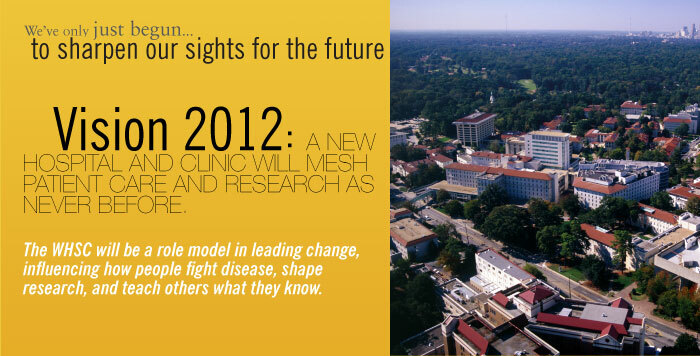 Hence, Vision 2012, a projection of what the Woodruff Health Sciences Center (WHSC) will look like by the time that next hill has become the new vantage point for surveying what lies ahead. By 2012, the WHSC will be not only one of our nation’s premier top 10 academic health centers but a role model in leading change, influencing how people fight disease, shape research, and teach others what they know. Cross-disciplinary collaboration will be a defining feature, so that talent and ideas coalesce throughout the health sciences, Emory, and beyond. Emerging technologies in genetics and diagnostics will mean that predicting and preventing disease will be the first order of the day, both in individuals and in populations, at home and around the globe. When people do get sick, they will benefit from measures to regenerate lost function presumed forever gone, from therapies targeted uniquely to their needs through genomics and proteomics, from teamwork blending expertise from all the health professions, and from constant conversation between caregiving and research. They will benefit also from new perspectives that go beyond the scope of individual specialties, that consider entire biologic systems in tracing occurrence of disease and in mapping strategies to halt its course. As these therapies and perspectives are implemented, they will undergo continual evaluation to provide feedback on how well they really work. The recipients of this feedback, clinicians and researchers, lifelong learners all, will depend on one another as never before to convey their newfound insights to the next generation to keep the process going. To realize this vision and make it operational, the WHSC has developed plans for new infrastructure and new programs. We have only just begun to pioneer 21st century medicine.